This 5.28 pound lunker was more than a great catch. It was a great paycheck too. 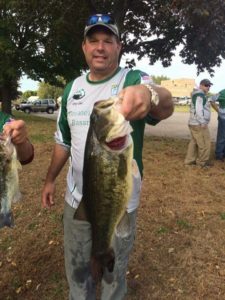 Greg L. caught this big large mouth on the first day of the Greater Chicago Bassmasters Classic on the Mississippi in Lacrosse, Wisconsin. With this catch, Greg cashed in on the GCB Lunker Pool, which had worked its way up to $1,390. For every GCB tournament, members can choose to put an additional $10 into the GCB Lunker Pool. The Pool is paid out to the angler who catches the biggest fish weighing over 5 pounds. If multiple 5 pound fish are caught in one tournament, the biggest one gets the pot. If no 5 pound fish are caught, it rolls over to the next tournament. And, if no fish over 5 pounds are caught for multiple tournaments, it rolls over until one is caught or rewards the pot to the angler who caught the next biggest fish. Heading into the Classic, Lou J. was poised to take the pot with a 4.66 pound largemouth he pulled in on Lake Geneva. Having also won Angler of the Year, Lou was ready for a clean sweep of the club’s biggest prizes. But Greg had other plans and worked hard, with his partner Jeff S., to find the big fish. Congratulations to Greg on catching this money fish! !